Item # 151611 Stash Points: 1,795 (?) This is the number of points you get in The Zumiez Stash for purchasing this item. Stash points are redeemable for exclusive rewards only available to Zumiez Stash members. To redeem your points check out the rewards catalog on thestash.zumiez.com. Get that classic checkered look you love from Vans with this three pack of Basic Assorted Canoodle no show socks. Coming in white, grey and black, these super-low cut socks hide under your shoes for a no-sock look without sacrificing comfort. They are finished with jacquard knit checked pattern on the toes and Vans logo graphics on the footbeds. 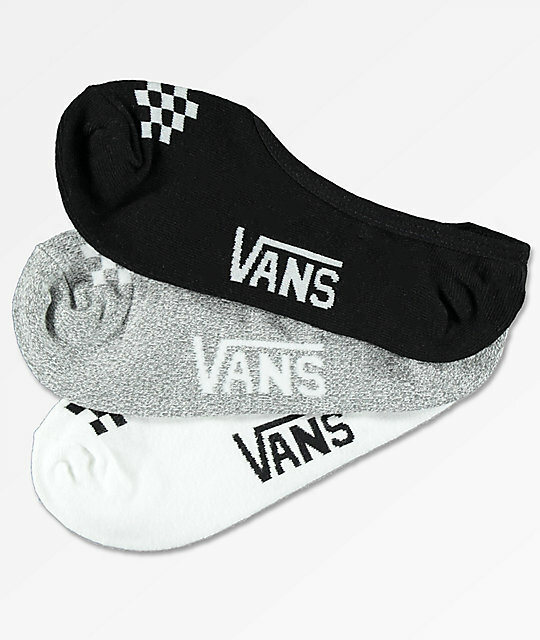 3 Pack Basic Assorted Canoodle No Show Socks from Vans. Pack of three pairs of socks. Super low cut to hide under shoes. Silicon textured piece at the back of heel to prevent slouching. Vans logo graphics on the footbeds. One white pair, one grey pair and one black pair. Checkered pattern on the toes. Fits women's shoe sizes 7-10. 72% cotton, 26% nylon, 2% elastane.